The idea regarding the possibility of the translation of the remains of holy priest Dun Karm Cachia from the cemetery to the Parish Church had been brewing for the last few years especially through the initiative of Canon Carmelo Cini, Canon Cantor of the Għarb Collegiate Parish Church and a member of our parish’s clergy. The idea became a reality on Saturday the 19th of October. 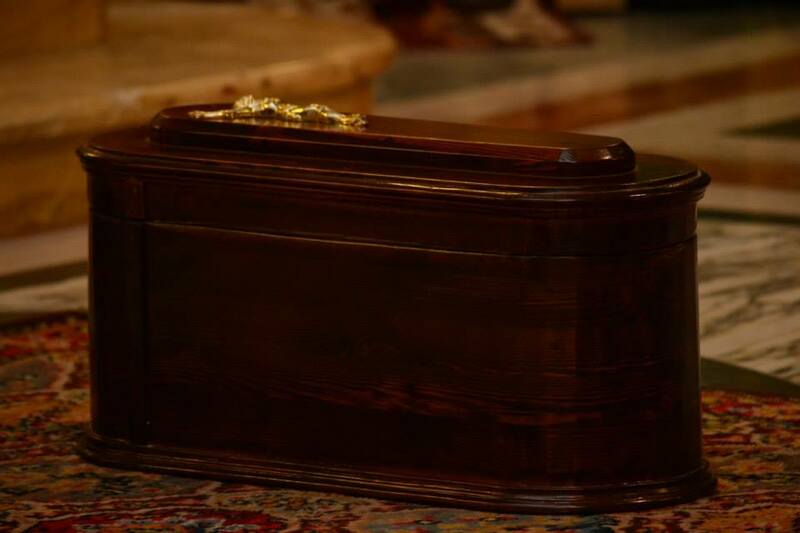 The remains of the holy priest who passed away in 1950 were put in a wooden box and put in the cemetery for the people’s veneration for an hour, between 4.30 and 5. 30 p.m. Then the translation with the remains began at 5. 30 p.m. Many parishioners walked as the Rosary was recited and the Archpriest Rev. Reuben Micallef led the procession. At 6. 15 p.m. Bishop Mario Grech presided over the Mass and various priests concelebrated. During his homily Bishop Grech spoke about the need for vocations to the priesthood and the holy life that Dun Karm led. Dun Karm Cachia used to spend many hours of prayer before the Blessed Sacrament. After the Mass, the remains were interred in altar of the Holy Rosary.